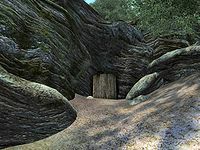 Moss Rock Cavern is a small cave north of the Imperial City containing necromancers (quest-related). It contains only one zone, Moss Rock Cavern. The Gravefinder's Repose: Help the innkeeper deal with a local Necromancer. This cave can be entered and fully explored without initiating the related quest, but Raelynn the Gravefinder will not be present. Two statuettes to Daedric Princes can be found in the cave, one of Namira and one of Molag Bal. The Necromancers of the cavern seem to have placed various offerings to the statuette of Molag Bal. This cave contains 3 Cairn Bolete plants and 8 Wisp Stalk plants. This location's map marker (M on map) is named Moss Rock Cavern (editor name MossRockCavernMapMarker). The entrance door is N of the marker, 60 feet away. This cave is fairly straightforward: upon entering from door Out you will find yourself in a room containing two enemies and the cave's only intersection. It is advisable to try and lure the enemies into the entrance tunnel, as the fighting might alert the others, located in adjacent rooms. In the northwest corner of this room is a Hard-locked wooden door (C) leading to the room where Raelynn can be found. If you are only interested in the related quest you can pick the lock and immediately fight her. 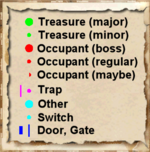 The other option is to go through the whole of the level until you find the key to the door. The next rooms are quite straightforward: simply fight your way through the various enemies you encounter until you reach the final room. In the large, rectangular-shaped room you will find three Undead enemies. They are, however, located on a lower level so try to use the advantage of high ground by killing them when they are below you or attempting to climb up. The final room holds two enemies, one of them the Boss-level Necromancer (A). Try to fight the first one in the corridor so that you can deal with the Necromancer Adept alone. The room also holds a Necromancer's Chest (k), which contains the key to Raelynn's room and a good chance of loot. There is also a bed (b) in the northeast corner and next to it you will find a sample of Ogre's Teeth and of Nightshade. Three Zombie are sprawled on an altar in the middle of the room. Backtrack to the wooden door and open it with the key. In the room you will find Raelynn (Q) and a second Boss-level Necromancer (A). Try to concentrate first on her and then on the Adept. Also in this room are two Boss Chests (B), two Daedric statuettes and an assortment of gems.